What are analytics and how are they different from reports? Simply summed up: “Reports provide data; analytics provide insight,” which is true, but not really helpful if you don’t know how, or why, this happens to be the case. I have discovered that there are layers to understanding – the more technical you get, the more you can understand the difference and potential of analytics. This article discusses the differentiators between reports and analytics, and the unique outputs of each. The first significant difference between reports and analytics is the source of the data. Your basic reports are run against the system in which the data was originally created, such as your HRMS, Learning Management System (LMS), or Accounts Payable system. These systems are transactional – or operational – meaning they are designed to help you efficiently perform certain tasks and keep records of those tasks. While these systems provide reporting options, it’s not their primary purpose. Take for example the hiring of a new employee. HR needs to create a record for that employee that captures their basic information, job title, and manager. This “hire” transaction – the creation of a core employee record – is performed in the HRMS. Once created, this record can then be accessed in other areas of the HRMS to perform new actions, such as benefits registration, IT provisioning, and payroll processing. However, there’s no single record that includes every event or action for an employee – the system simply couldn’t operate if it had to access a giant file like this each and every time a user accessed an area of the system. Instead, the records of each transaction are split across the HRMS and only the ones necessary are accessed – a pay record here, benefits over there, and performance reviews somewhere else – each with a connection back to the core employee record, but not to each other. Because the technical structure underpinning transactional systems are designed to facilitate system performance so you can complete all of your actions quickly: searching up a record, making a change, and saving that change. However, this same structure also makes it difficult (if not impossible) to create reports that are sourcing data from different locations within the system. Analytic solutions, meanwhile, are designed specifically to connect data from different records (more on this in the Siloed versus Unified section below), transform and normalize it, and facilitate the exploration of that data. The restrictions and connections necessary in a transactional solution aren’t needed in an analytic solution; the data can be structured and organized to optimize analytics. Where your HRMS can’t store a single thread of every event involving an employee, a well-designed analytic solution can. Data can be connected and joined in a fashion that optimizes retrieval, especially when coupled with a powerful query engine. For example, Visier’s query engine can execute complex queries literally millions of times faster than a traditional database. 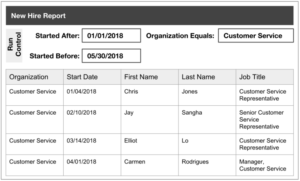 Reports in your transactional system are defined before you run them, and these definitions include which data columns will be included in the report. 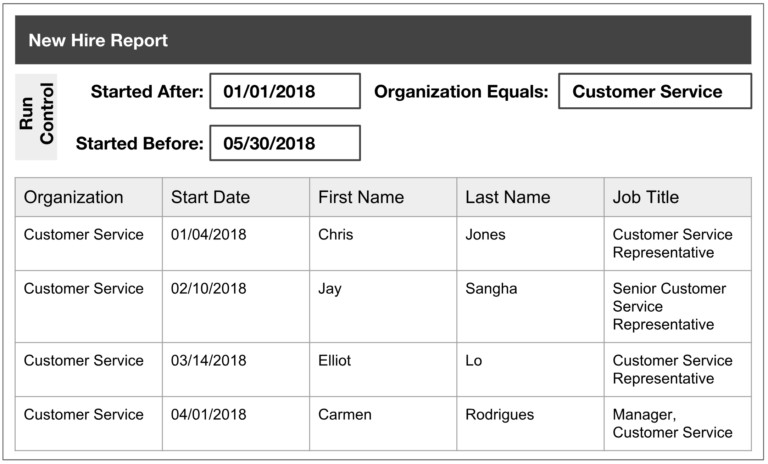 You may have controls on your report that allow you to set parameters for the report results, such as date range or by organization, but you’re still limited to receiving just those columns in the report. If you want different columns, you’ll need to run a different report or, if you have access to the report writing tool, you’ll need to write your own report and then run it. On the other hand, analytics display results for the selected parameters in a visualization intended to illustrate patterns and trends, bringing insights to the forefront without you or your team having to do any of the heavy lifting. In addition, analytics encourage exploration, as well as the user’s natural inclination to see the results and ask themselves, “I wonder what else there is?” The viewer can change or add filters to get new results in real time. In the image I added an additional metric of “Employment Start Type” and the results refreshed immediately. Again, because analytics is dynamic, the user has the ability to drill even further into the details. Very few businesses leverage a single system for absolutely every business transaction. More often than not, it’s an enterprise solution that’s used to perform the core functions (such as an HRMS for employee data, benefits, payroll), with niche, best-of-breed solutions, such as an LMS, employee engagement tool, or an Applicant Tracking System (ATS), used to manage other functions relating to the employee. This means that there are employee-related records in multiple solutions. When data relating to a single object (such as an employee) resides in different solutions like this, the only way to look at that data side-by-side is to pull separate reports and then, manually manipulate the files to create a single report. This becomes even more complex when organizations have multiples of the same solution (multiple payrolls, multiple HRMSs, and more). It becomes nearly impossible to get something as simple as an accurate headcount number! An analytic solution brings all the data together. When it’s properly designed, it creates the connections across all of your data points, giving you a seamless and single point of access across your entire organization. For example, it can be impossible to get measures on your quality of hire because your ATS can’t see what happens to the candidates once they’re hired. This is due to their employee data residing only in the HRMS and other employee solutions. 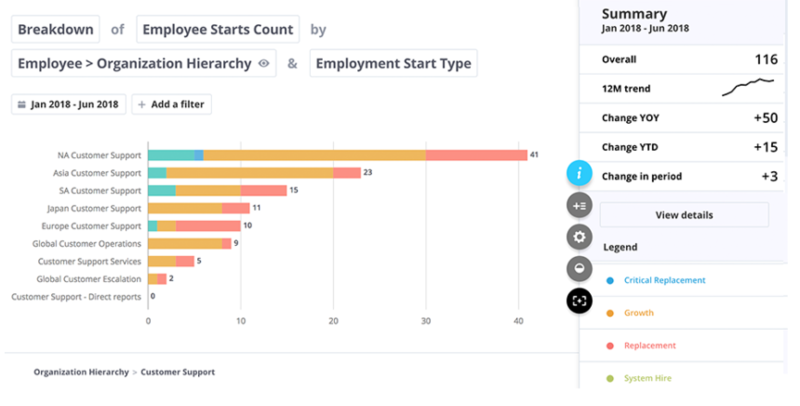 But when you unify recruiting data with information from the rest of the employee lifecycle, you are able to follow the thread from the point of hire and beyond, and spot important trends that could impact retention, productivity, engagement, and more. Click here to continue reading Caitlin Bigsby’s article.